Never heard of Tipp-Kick? Well, think of it as an alternative to Subbuteo, but with kicking players and a two tone ball. It’s been around in Europe since the early 20s and indeed is still going strong – although this Tipp-Kick holdall from LogoBag owes more to its past that its present. 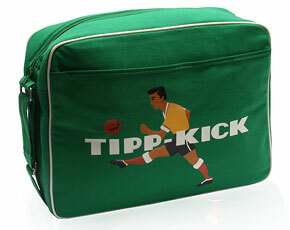 This canvas bag is in a bold green with contrast trim and a vintage-style Tipp-Kick logo on the front. There’s also an adjustable strap, a large storage area and smaller pocket on the side. You can pick it up online, priced at £25.